Leicestershire Yeomanry leaving the town on their way to camp. The WW1 Roll of Honour is a complete list of all 565 men from Loughborough who lost their lives in the Great War. It includes not only the names of 478 men engraved on the bronze memorial tablets of the Carillon Tower, but also the names of 87 other men who died and whose names are all missing from the Memorial in Queen's Park. 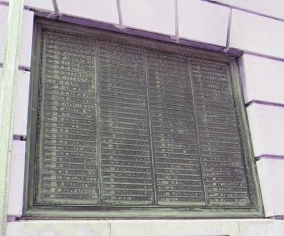 The original list of soldiers whose names are to be found on the Carillon Tower is given in The List of the Fallen at the end of the web page on The History of the Memorial. Click on a particular section of the alphabet in the menu on the right-hand side of the web-page and then scroll down the full list provided for that section. Click on Search WW1 Roll of Honour at the foot of the A-Z list, enter the man's name, or some part of the name, in the Keywords box and click Find. On the list of name(s) provided choose the appropriate man and click on more details. One of the bronze plaques on the side of the Carillon Tower, Queens Park, listing 478 of the Loughborough fallen. When the Loughborough War Memorial Committee began the fundraising process for the memorial in August 1920 they discovered that there were still many people in Loughborough and district who were unaware of the memorial plans. The Committee therefore produced a 16 page booklet 'with the object of setting before the public the chief features of the proposal'. This booklet also included a list of 319 names of Loughborough men who had lost their lives in the war, with the following note: 'If any inaccuracies or omissions occur in the above list the Committee will be grateful if corrections are sent to Mr. H. J. Deane, Town Hall Passage, so that the final roll, to be placed in the Memorial, may be complete and correct'. The booklet was issued to every household in the borough. 159 names were subsequently added to the list of the fallen, but even so, this figure is still well short of the full number of men lost. Loughborough is not alone in having names missing from its War Memorial. A Scottish historian, Neil Anderson, for example, revealed that 150 names had been missed off the First World War Memorial in Bathgate, West Lothian. The memorial at Stalybridge, Greater Manchester, has been found to have some 300 names missing. Why Were the Names Missing? The person might have been a woman. They were not included, even if they died while on service. The person might have been a civilian. They were not included, nor recorded by the Commonwealth War Graves Commission. The person might have died from disease after the war. Some were included; others, whose illnesses could well have been attributable to service (for example disability through wounds or gas attacks), were not, as they survived for some years afterwards. The committee decided that a particular person was not eligible, on any one of several criteria. 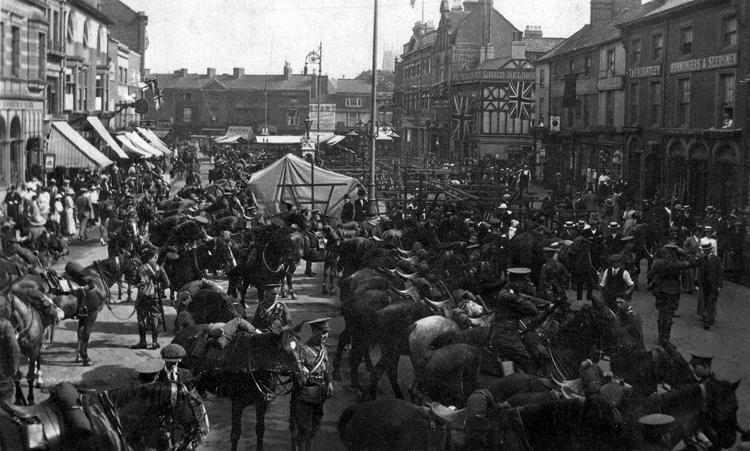 Leicestershire Yeomanry in the centre of Loughborough, November 1914. That if a casualty were commemorated on their Town Memorial she or he could not be commemorated on a war memorial elsewhere. This belief resulted from confusion between government commemoration by the Commonwealth War Graves Commission - CWGC and civic and/or community commemoration. That the War Memorial Committee of Dover Town Council in 1924 somehow "knew" from some central official catalogue who to include on the Town Memorial. The names were in fact gathered from canvassing workplaces and schools and from advertising in Dover for nominations. Consequently many of those who qualified by virtue of their connection with the town were not included. 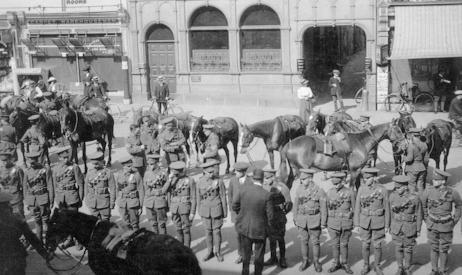 Leicestershire Yeomanry assemble in the Market Place, Loughborough, November 1914. Some researchers elsewhere in the UK have noted that sometimes a bereaved mother or wife did not wish to be reminded of her loss every time she walked past the local war memorial on her way to the shops. Others have noted that occasionally, when there was a charge payable for the inclusion of a name some families declined to pay, although no evidence has been found that a charge was payable in Loughborough.